Last time we co-authored a blog post, Steven Anderson and I shared Blab. It was so much fun and such an easy app to integrate into the classroom we wanted to share another favorite of ours! Recap is a free video response app created by Swivl which allows students to reflect, respond, and demonstrate through video. Recap is easy to use as both an educator and as a student. It is also an excellent way to model and use digital literacy modes in the classroom! Simply create a class and assign a Recap to students. Questions or prompts can be teacher-created in the forms of text or video, and can be assigned to individual students, small groups, or to the whole-class. When completed, teachers can share the whole “Review Reel”, or each individual child’s video. Share options include email or weblink! Reading Interest Inventory – At the beginning of the year, giving students a “Reading Interest Inventory” provides valuable information about each students’ reading preferences and how they view themselves as readers. It also provides a launchpad to place the “right book” into their hands that may hook a reader for a lifetime. Using Recap, students could record themselves on their computer or ipad. These video responses would provide valuable insight to climate and culture of literacy in the classroom. Here are a few of unique questions to include on a Reading Interest Inventory: What is your earliest memory of reading or books? How do you choose a book? What do you notice adults reading? When should a person leave a book? What two books or magazines do you wish we had in our classroom library? Student Goals and Reflection – Another way Recap could be used at the beginning of the school year is to capture a student’s goals for the year. Part of educating the Whole Child is helping the student see where they are with their learning and where ultimately they want to end up. We know that learning is a continuum. So using Recap students can record where they’d like to see their learning be at the end of the school year. Maybe they want to be a better math student. Or perhaps they want to be able to read more proficiently. What ever their goal they can capture it. Then throughout the school year they can refer back to it. Use it as part of their own personal reflective practice. How are they progressing? What do they still want to do. Have they met their goal and maybe it’s time for another. These videos can become a part of a larger learning portfolio where students examine their learning throughout the year. Parent Involvement – At the beginning of each school year, many of our youngest learners attend a back-to-school night or an open-house in which they meet their teacher, unpack their school supplies, and explore their new surroundings in the safety of their parents. It is also a time that many parents and family members come to the realization that their child is growing up and “leaving the nest”. What a perfect time to have a “message station” set up for parents or family members to leave a Recap for their student. Imagine the joy in a child’s eye after receiving a message from their parent or family member on their first day of school. Recap classes can be accessed through a pin number assigned to the class, so those parents or family members unable to attend can record their message from anywhere. It is also a great way to demonstrate to parents how you will meet the digital literacy demands in the Common Core State Standards, as well as how technology can be used in a meaningful way even with our youngest learners! Recap is an engaging and creative way for students to share their understanding through video response! Recap is a free app and is available via the web (so perfect for chromebooks), as well as an iPad app. Coming soon – a phone app, Recap from anywhere at anytime! Formative and summative assessment are familiar terms to most students and educators. When used intentionally, both assessment types can be used to identify student needs and help educators design differentiated learning opportunities. Student-Centered Assessment, on the other hand, is a less familar term with many educators. Student-Centered Assessment can be used during the process of learning, at the end of units, or even extend across a student’s year. The three key components that all Student-Centered Assessments have in common are: identified standards and learning targets, they are best utilized during the learning process, but can be adapted to also serve a more summative need, and finally, they are designed to be used by the student! Below are three specific examples, along with technology tools that I find fit the desired intent. Self-Assessment – When used while the learning is taking place, self-assessment is an effective tool which places ownership in assessing and learning back into the hands of the student. Self-assessment promotes learning by having students reflect upon their strengths and weakness in their own work. When used during the process of learning instead of at the end of the learning, self-assessments generate areas that are personal to the students, a time to revise and rework their product, and the ability to measure their work to the learning targets, standards, and personal skills. Self-assessment can be in the form of rubrics, checklists, or evidenced in written or oral responses. Google Keep would be an excellent digital tool to support the use of checklists in self-assessment. Google Keep is simple to use, easy to share, and is customizable for use. Peer-Assessment – Similar to Self-Assessment, Peer-Assessment is best done during the learning process. In fact, it makes no sense to have students use this tool after the product is completed. Peer-Assessment employs students giving feedback to each other that is specific and evidenced by specific examples that are aligned to the learning target. Many educators find this tool great in theory, but students struggle when applying. Scaffolding, modeling, and clear expectations are needed to not only help students find areas of focus in another peer’s work; but also, explicit instruction and practice of soft skills that address collaboration and communication? How does one effectively work with a peer in a collaborative setting. What type of feedback is most valuable? With these objectives in mind, along with the professional understanding that the student doing the fixing is the one doing the learning; utilizing something like the “Suggesting” setting in Google Docs provides a digital tool to support Self-Assessment. “Suggest Edits” instead of directly writing on the work, editing, or even commenting, shifts revision and reflection back to the author of the piece. Portfolios – Two types of Portfolios are commonly used in the educational setting. First, a portfolio can be used as a “Process Portfolio”. A process portfolio would be documentation of a students growth, from novice to master, typically based within a unit and have an identified group of standards or learning target. When used throughout the learning, process portfolios can act as a documentation of a student’s journey in learning. It can help them set goals, and serve as a visual to remind students where they began and how their understanding transformed during the unit. A second type of portfolio found in educational settings is that of a summative collection of their best work. While examples of student’s learning could be placed throughout the learning process, a summative portfolio demands the student to reflect on their work throughout the year, evaluate it against the determined standards or learning targets, and then justify the pieces they place within the portfolio as the ones demonstrating their best work. Summative portfoliosare best used organically, and travel and change with the student as they progress through grades. Google Sites would be a versatile, digital tool for either type of portfolio. From embedding images, documents, and videos; to uploading mp3s of vocal solos or embedding multimodal creations, Google Sites have always been a perferred choice with my former students. As I prepare to begin my second year as a consultant for a state organization, a conversation I had with an administrator many months ago weighs heavily on my mind. Actually, one sentence he stated specifically. Upon the completion of my graduate degree, I knew I wanted to pursue a different type of leadership role within the education field. I debated, and am still debating, if being a principal or superintendent is the right calling for me, but I knew it was time for me to take a new career path. 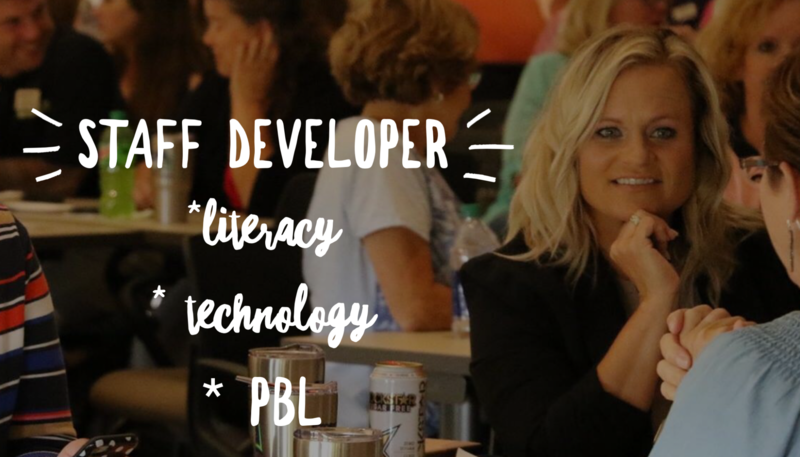 As luck would have it, a position opened up that provided opportunity to blend my passions of literacy and technology while assisting districts with school improvement initiatives. As I explained to my son one day, my new role would allow me to have an impact on the education of many students across the state. I was proud of this opportunity. That is, until I realized that some view my job as detached and uninspiring. The one sentence mumbled in the middle of a conversation is something I think about weekly. And although I do not have a clear opinion yet, I reflect upon it often.